AUSTIN, TX—Visit Austin, Norwegian Air and Austin Bergstrom International Airport (ABIA) today announced Austin as one of two new US routes from London Gatwick Airport (LGW). The announcement comes after Norwegian Air celebrates their third anniversary since it first began low-cost long-haul services from Gatwick. 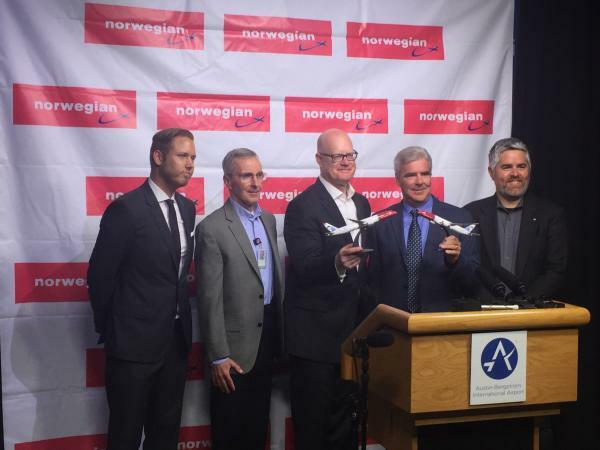 Anders Lindström, Norwegian Air, Jim Smith, ABIA Director, Tom Noonan, President and CEO of Visit Austin, Doug Driskill, Dell Executive and Chair of Airport Task Force, and Austin City Council Member Jimmy Flannigan, District 6, at the press conference in Austin, TX. Starting on 27th March 2018, Norwegian will begin flights to Austin with a new year-round, three-weekly service to ABIA, with fares available from £239 one way and Premium fares from £579. The eight-hour flight will depart from Barbara Jordan Terminal at 4:20 p.m. and arrive in London at 7:20 a.m. The new route from London Gatwick to Austin will be operated by new Boeing 787-9 Dreamliner aircraft offering passengers a spacious, modern economy cabin with seat-back in-flight entertainment, together with a Premium cabin offering more legroom, complimentary meal service, generous baggage allowance and airport lounge access. Flights are now on sale at www.norwegian.com. Visit Austin is the official destination marketing and sales organization for the City of Austin. An accredited member of the Destination Marketing Association International, Visit Austin is charged with marketing Austin nationally and internationally as a premier business and leisure destination, thus enriching our community&apos;s overall quality of life. Visit Austin is only an organizational name change as we are still Austin Convention and Visitors Bureau doing business as Visit Austin. In 2015, the greater Austin MSA welcomed 24.1 million visitors who contributed to $7 billion in economic impact and 124,000 jobs.